Above is a copy of Nicolas Louis de Lacaille’s star chart on which his 14 new southern constellations were first published. They are mixed in with the old Ptolemaic figures and the newer additions by Keyser, de Houtman, and Plancius. Lacaille rearranged some of Keyser and de Houtman’s southern constellations to make way for his own, notably in the case of Hydrus, which was rerouted and had its tail cropped. The original engraving appeared in the Mémoires of the Académie Royal des Sciences dated 1752 but actually published in 1756. Lacaille described his new constellations in the accompanying text. This copy of the planisphere is from Jean Fortin’s Atlas Céleste and gives constellation names in French, as did Lacaille’s original. © illustration and text Ian Ridpath. All rights reserved. l’Atelier du Sculpteur (Sculptor); la Boussole (Pyxis); les Burins (Caelum); le Chevalet et la Palette (Pictor); le Compas (Circinus); l’Equerre et la Regle (Norma); le Fourneau (Fornax); l’Horloge (Horologium); la Machine Pneumatique (Antlia); le Microscope (Microscopium); Montagne de la Table (Mensa); l’Octans de Reflexion (Octans); le Reticule Romboide (Reticulum); le Telescope (Telescopium). 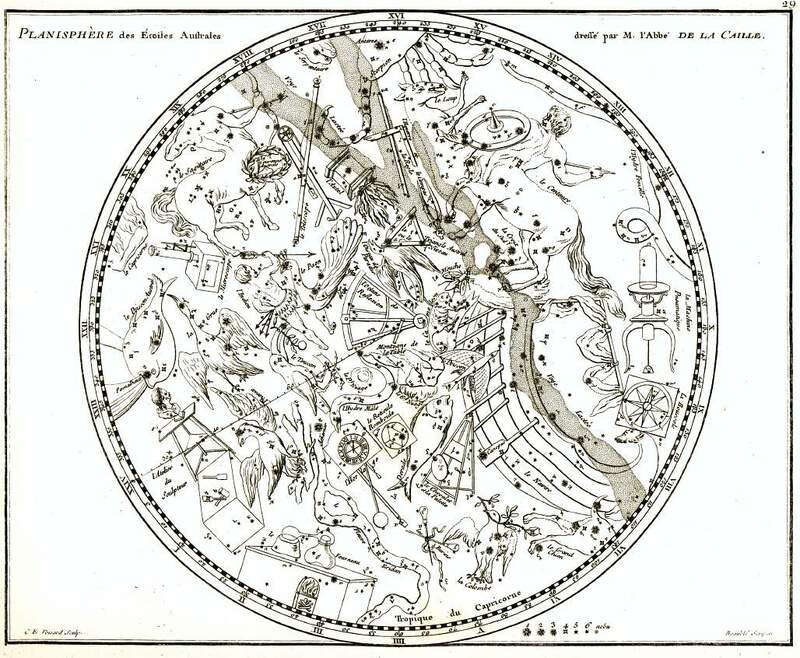 Lacaille also included the 12 constellations of Keyser and de Houtman under the following names: le Cameleon (Chamaeleon); le Dorade (Dorado); la Grue (Grus); l’Hydre Mâle (Hydrus); l’Indien (Indus); la Mouche (Musca); l’Oiseau de Paradis (Apus); le Paon (Pavo); le Phenix (Phoenix); le Poisson Volant (Volans); le Toucan (Tucana); le Triangle Austral ou le Niveau (Triangulum Australe, ‘or the level’ – he depicted it with an attached plumb bob). Note that although Lacaille subdivided Argo Navis into the Keel (Corps), Poop (Pouppe), and Sails (Voilure) in his accompanying catalogue, he still depicted it as a unified figure on his chart (le Navire).